(Newser) – Jamie Anderson gave the United States a gold-medal sweep in the first Olympic slopestyle snowboarding competition, while Jenny Jones took bronze to give Britain its first ever medal in any snow sport. 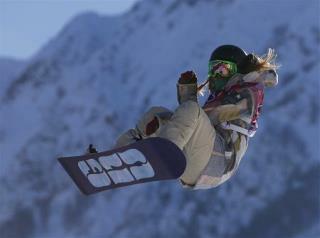 Anderson soared her way to the gold in a near flawless run in the women's final today, a day after Sage Kotsenburg captured the men's gold medal. Enni Rukajarvi of Finland took silver and Jones, a 33-year-old former maid at a ski resort, delivered a long-awaited medal for Britain. Everyone who competes in Snowboarding should get a gold medal. There are no two things which are more dissimilar; Greek Olympics, and soap-selling re-incarnation of them currently dominating people's evenings.